Here's everything you need to know about Immortals, the new movie from director Tarsam Singh that's (extremely) loosely based on Thesus, the hero from Greek mythology: At one point, Zeus gets super mad at Apollo for interfering with the humans, so he blasts him through a stone wall. It's built up as this huge moment for Zeus that shows how dedicated he is to allowing mankind to forge its own destiny rather than be shepherded by the gods, and clearly meant to be a big, pivotal moment for the film. And then we see that the blast has left a perfectly Apollo-shaped hole in the rock as if he were a Looney Tunes Character. That's Immortals in a nutshell.I'll be honest with you, folks: Aside from the whole minotaur-in-the-labyrinth thing, the mythological equivalent of a Greatest Hits record, I wasn't all that familiar with Theseus before I went into the movie. As it turns out, I didn't need to be worried -- I don't think anybody involved with making this movie was really familiar with it either -- but I figured I might as well do the absolute bare minimum of research before I went in. So I asked comic book writer Benito Cereno if he could give me a crash course on Theseus, his favorite mythological hero. Among the many things he told me were the interesting facts that Theseus invented both wrestling and the mullet, which he used to prevent other wrestlers from being able to get a grip on his hair by keeping it short in front. Sadly, Immortals chose to completely ignore Theseus's status as the ancestor to modern-day Hulkamania, and instead chose to tell a story that I could best describe as an episode of Hercules: The Legendary Journeys with a ridiculously huge budget. All that stuff? I am totally fine with it. The problem is that while Hercules and Xena did things like that in a way that let you know they were in on the joke. Immortals never comes within a hundred miles of anything even remotely resembling self-awareness. As the prime example, let's have a look at the Minotaur. This is the one element of Theseus's myth that the average person would recognize. It's the signature piece of his story, like Robin Hood and the archery contest where he splits the arrow down the middle. While the movie actually does include the Minotaur and the Labyrinth, it does it in the most ridiculous, unintentionally hilarious way that it can. For starters, the Minotaur itself is not a giant half-bull/half-man monster. Instead, he's just some big dude with a bull-head helmet wrapped in barbed wire. Seriously. And I want to stress, this isn't a movie like Troy, which was based around stripping all the mythological elements out of The Iliad. This is a movie where the mythological gods not only exist, they occasionally jump off of Mount Olympus and do Macho Man Randy Savage elbow drops into the ocean in order to save our protagonist. Hell, the entire premise of the movie is built on there being some +5 Brilliant Energy Longbow of Smiting forged by Ares that everyone's running after, so it's not like this is a movie that shies away from the mythical stuff. But apparently, the bull-monster was a step too far, so instead we get the laughably X-Treme version of a guy with a barbed wire cow-head. 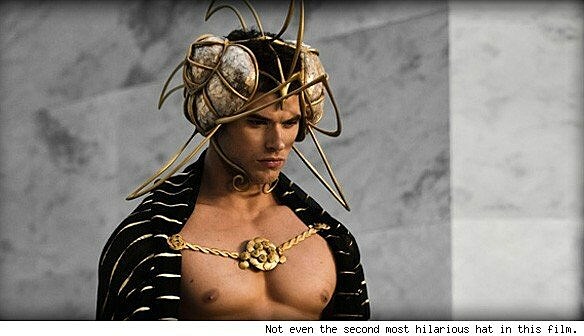 He eventually does show up in the Labyrinth and fight Theseus, though. Well, he shows up in a labyrinth. 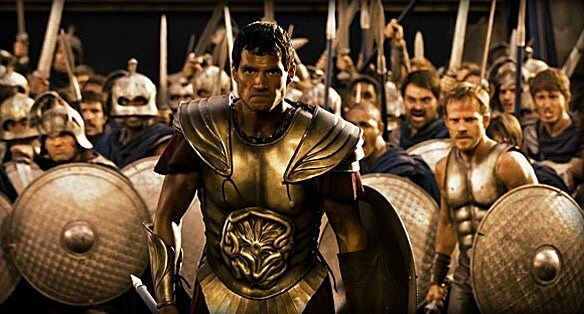 In Immortals, it's just a big crypt where Theseus goes to bury his mom that doesn't have a very intuitive layout. There's a half-hearted attempt to play it up by having Theseus take a truly ridiculous tactic so he can find his way out: cutting his own leg open so that he can follow his bloody footprints when he needs to leave. Quick side note: Isn't Theseus supposed to be smart? Like, isn't that his entire deal? And wouldn't it be a lot smarter to find a way out of the labyrinth that did not involve hobbling himself with a knife? Maybe he could get his foot all muddy before he went in there? Or, and I'm just throwing this out there because I think I might've heard it somewhere, maybe use a string? It's also never mentioned at all in the fight scene that follows that he has stabbed himself in the calf, making it both dumb and pointless, but I'll get to Theseus's shortcomings in a minute. Back to the Minotaur, he just wanders into the labyrinth -- presumably following Theseus's footprints -- and they have the most anticlimactic fight they could possibly have. This is right after Theseus finds the big magical Epirus bow that the whole movie revolves around, so you'd think this would where he uses it to defeat his most famous foe. But he doesn't. Instead, he just sort of knocks the Minotaur down, picks up a club, and wails on him for a few minutes. Theseus actually hits the Minotaur so many times that he gets tired, sits down, takes a little break, then stands up and finishes killing him. I kid you not. That actually happens in the movie. I think we're supposed to see it as this big triumph, because that's how the movie acts, but it's just slapstick with blood. But the absolute perfect example of this comes in what is unintentionally the best movie moment I've seen all year. 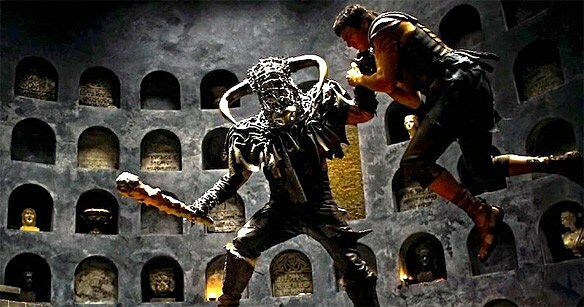 The Minotaur is the #1 henchman of the bad guy, Hyperion (Mickey Rourke), who for some reason spends a lot of time in the movie in a helmet that makes him look like a big angry bunny rabbit. There's a scene where this traitor shows up at Hyperion's place to rat out Theseus, and Hyperion gives him this big speech about bloodlines and how he wants to destroy everyone else's bloodline and allow his own to flourish so that he can become... immortal (get it?). Then, to prove his point, he orders the Minotaur to finish off this dude's bloodline. So the Minotaur sits the guy down, kicks his legs apart, picks up a gigantic hammer, and bashes him right in the junk. It. Is. Hilarious. But in the context of the movie, it's meant to be this scene where we realize how ruthless Hyperion is, and how he's willing to torture even those who are trying to ally themselves with him. But it does it by having a dude in a cow helmet score a nut-shot on a dude with a clown hammer. It looks like something Harley Quinn should be carrying around. Even that, though, would just add another layer of enjoyment to a movie that had a solid core to it, but that is not the case with Immortals, and the biggest problem of all comes from Theseus himself. 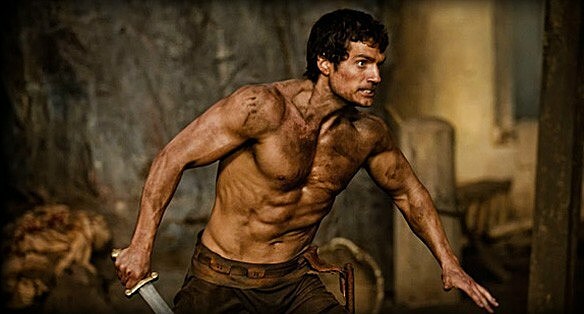 Don't get me wrong: Henry Cavill does a perfectly fine job with what he's given, especially when he's given the opportunity to run around without his shirt on, and I'm sure that his experience running around in a cape in this thing will be invaluable to him later when he takes on the role of Superman. The problem is the fact that a bunch of people got together and spent a lot of money to make an entire movie about a character without actually having him accomplish anything at all. As I said earlier, the entire movie is built around this magic bow that Hyperion wants to get so that he can use it to free the Titans from their prison, which is this little stone cube at the center of a mountain. I feel I should note at this point that the Titans are about 12 guys of average height, but, you know, whatever. Point is, this whole thing is set up as sort of a race-against-time thing: Can Theseus get to the bow before Hyperion, save the world, and fulfill humanity's destiny? Well, no. He can't. Because about a half hour into it, the movie decides that saving the world isn't a good enough motivation for Theseus, so Hyperion also kills his mother. So now it's a story of Theseus hunting down Hyperion to take his revenge, which is a good thing because as soon as he gets the bow, he blunders into a trap, loses it to Hyperion, and has to be saved by the gods. And that's where the story of this movie goes clean off the rails. Theseus doesn't do anything. Instead, he gets saved by the gods at every turn, which makes me wonder why we're spending time watching this loser instead of following them around, because they seem pretty awesome. Theseus doesn't stop Hyperion from getting the bow; he doesn't stop Hyperion from using the bow in order to free the Titans, and he doesn't really participate in the big battle against Hyperion's army. Even the big fistfight between Hyperion and Theseus -- ostensibly the climax of the film -- is overshadowed by the fact that the gods are waging this life-and-death, fate-of-the-world battle against the Titans at the same time, and is rendered utterly inconsequential when the gods bring the whole mountain down around everyone. And that stuff's awesome. I mean, it's completely insane, but it's awesome -- Singh's visual style gets to go absolutely nuts when the gods show up to have their gigantic rumble where they inexplicably pull out kung fu weapons and start thrashing the Titans. There's this really cool effect where everyone's moving at normal speed until they die, when they slow down to reveal that we're watching a battle that's happening at super-high speed. Dudes are getting torn apart left and right, Athena's got a pair of kama that she's using, and Zeus is blasting their heads off with a meteor hammer. Zeus has a meteor hammer! Total lunacy aside, I would totally watch a movie about that. Which is exactly the problem: This movie is supposed to be about Theseus, and yet it constantly shows us that he can't get anything done on his own. Remember Conan the Barbarian? Remember how Conan is awesome, because he does stuff, and even in the one moment of the movie where you hear him pray to his god, Conan's telling him that he doesn't give a damn if Crom gives him any help, because he's going to get this thing done whether you like it or not? That's how you do a fantasy hero. He can have help, but when it comes down to it, the guy that's supposed to be the hero of your story needs to step up and accomplish something himself. Nobody wants to watch him while he's watching someone else do all the cool stuff. And that's where Immortals goes wrong. It's a mess, and no amount of visual spectacle, unintentional hilarity, or pretty people can fix a story that's broken on such a fundamental level.